Learn how to make Best Buttercream Frosting recipe that is not too sweet with this easy video tutorial recipe post!! 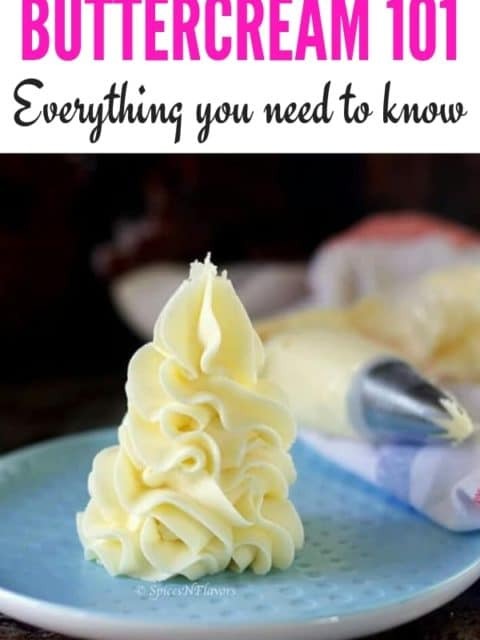 And the best part – it covers all the tips and techniques you need to help you achieve perfect, creamy and fluffy American buttercream and also makes a great base for other frosting flavours like chocolate, strawberry, Nutella etc. What makes this the Best Buttercream Frosting recipe? NOT TOO SWEET – I know the main criteria right!! 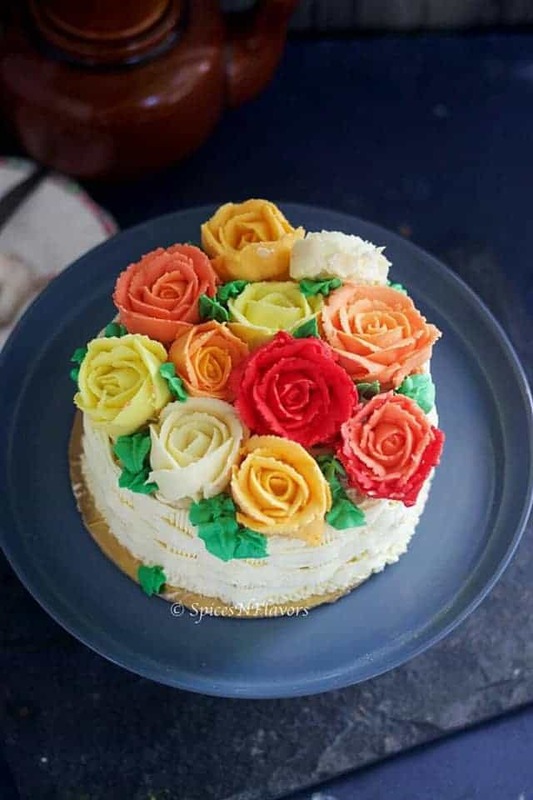 Same recipe – endless uses: decorating cakes, piping flowers, layering cakes, icing wedding cakes, buttercream roses and lot more!!! Now that, in my opinion, is the perfect Buttercream Frosting recipe that you need in your life. And this recipe ticks all the above boxes so now I can claim it to be the Best Buttercream Frosting. Or can I?? Wait till we get into the details. 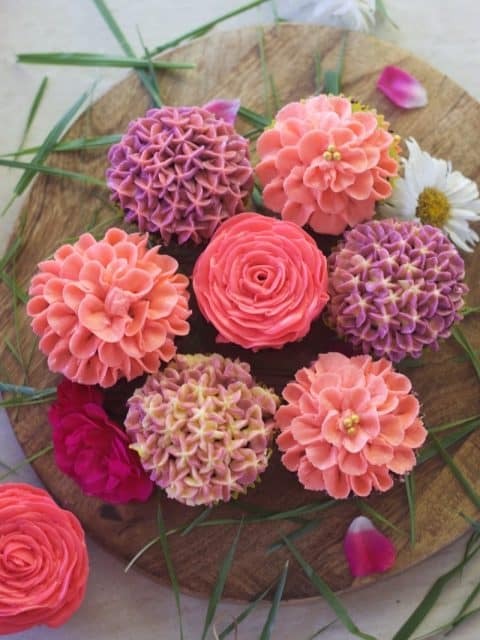 For those of you do not know, I will just mention in brief that it is a type of basic icing – a soft mixture made using butter and sugar that you can use as a filling in cakes, frost cakes, layer the cakes, frost cupcakes, piping cakes and cupcakes, make roses; the choices are just unlimited once you master this basic frosting recipe. Now you might have observed most of the recipe calls for room temperature butter. Well, its 22.5°C now at this moment when I am drafting this post which might not be the case in from where you are reading this post right!!! 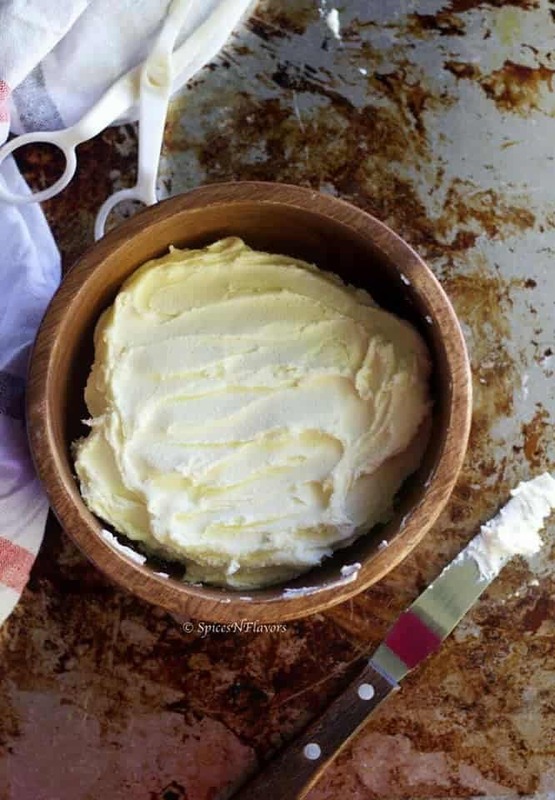 Now if for example, you make your vanilla buttercream frosting with butter that was softened at a warmer temperature, that is, imagine you are making vanilla buttercream recipe in summer, room temperature would mean you’ll end up with buttercream that’s too soft. Then you will have to add extra confectioner’s sugar to make it firmer, and that ends up making your frosting too sweet. So what exactly do you mean by room temperature? The butter has to be soft as in when you try to press your finger on to it, you should be able to easily slide through the slab of butter. Always a good idea to cube your butter down and then start with the recipe. Helps to beat the butter easily that way. Makes sense right!!! Hence always use softened and cubed butter. However, do note that “it should not be in the melted form”. That way you won’t be able to beat the butter until light and fluffy. Never ever use granulated sugar. The only type of sugar that you need to make this simple buttercream frosting is ICING SUGAR or confectioner’s sugar. Also, do not use sugar powdered in your mixer grinder because it will be coarser and the buttercream will not be smooth. You want the Best Buttercream Frosting to tick all the boxes right!! One more advantage of using store bought icing sugar is that it already has cornstarch added in it which gives additional stability to our buttercream. Once you add the sugar the buttercream would be too stiff to handle. Do not panic!! You want to bring it to a consistency where it would easy to do the job, that you need the fluffy buttercream frosting for – piping, layering, filling or frosting. And your best friend for the same is LIQUID of your choice – Cream, Milk or Water. Undoubtedly, Cream. And why so? Simply because adding cream would definitely make your buttercream creamier and tastier. Does that mean you cannot use Milk or Water? Unless you are making vanilla buttercream frosting or chocolate buttercream frosting you would need some basic colours like green, pink, orange and red. I have discussed the detailed topic on COLOURING YOUR BUTTERCREAM below so do keep reading!!! Now that was our basic ingredients for making Basic Buttercream recipe or a simple Homemade Buttercream recipe. Do you think commercial bakeries can afford to use pure real Butter for the cakes that they make? Obviously NOT. And so here comes in play – Shortening. Oh by the way if you like the writing on the cake then I have a detailed post on 6 tips to help you master the art of writing on cake do check that by clicking here. What is Shortening and why do Bakeries use it? Shortening is also a type of fat that you can use to make pastries and cakes. So what’s the big deal? Well, shortening is solid at room temperature unlike our regular butter, which means you do not need any separate equipment (like a fridge) to store shortening. You can easily store it at room temperature. As it is not a real fat, you know, it is much much cheaper than butter and easily affordable. Shortening is not as sensitive as butter to heat which means a cake made using shortening won’t melt down as easily as the one made using butter. Now you get it right – planning a Beach Party or an Outdoor Wedding you want to use shortening in your buttercream for a much sturdy and long lasting cake. Another thing is that buttercream icing made using shortening is super super white like cloud unlike the ones made using butter which is generally creamish in colour. Phew… now you know why bakeries prefer shortening.. I know you are wondering but how does it taste like? Honestly, it is not the best buttercream frosting you would taste but yeah it is not that bad either when made correctly. Any time you will obviously prefer the ones made using butter but like mentioned above the use of shortening in a recipe would vary depending upon the purpose of the cake. 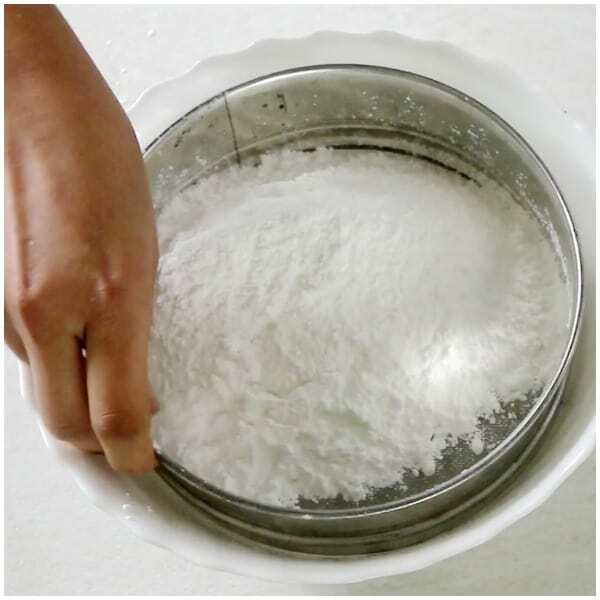 Ever wondered how to make icing without powdered sugar? Yes, you read it right – Condensed Milk Buttercream is all the rage now. 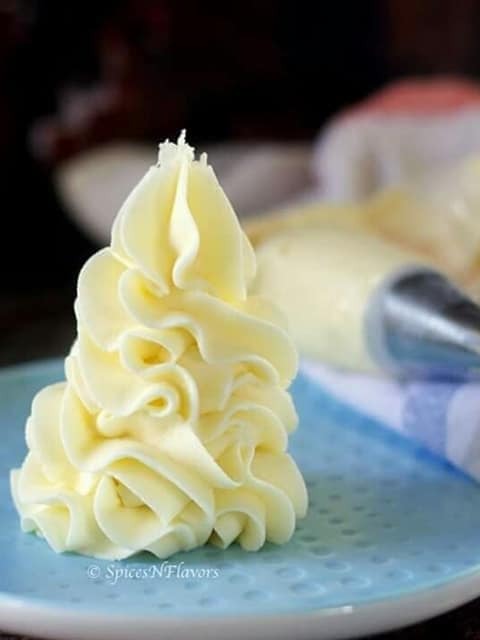 Buttercream made using Condensed Milk is so dreamy and ultra-smooth, you would not believe when I say its like eating a cloud. Totally melts in your mouth, so light and fluffy, you have to try it once for sure. And no grits of sugar at all.. It does tastes milkier definitely but so flavour packed that honestly, I do not mind. The only downside is if you could use the same amount of butter and the same recipe and the same pattern you could frost 18 cupcakes using icing sugar whereas with condensed milk you could just frost 8 cupcakes. Look at that.. Ain’t that cupcake frosted with condensed milk buttercream looks stunning.. Here are my 5 important Tips to help you perfect your Buttercream icing recipe!!! By room temperature butter, recipes mean you must use softened butter through which you can easily slide your finger. Always beat the butter until it is light, creamy, fluffy and pale before starting to add icing sugar. 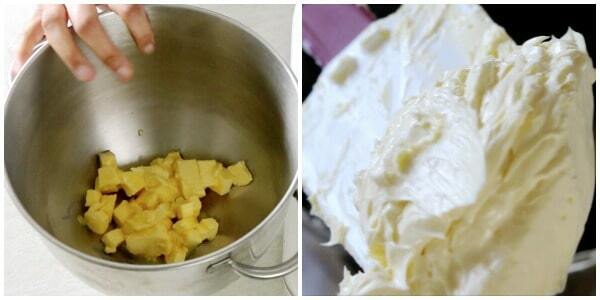 This is the secret of making fluffy buttercream frosting. It is important to sift the icing sugar at least twice before adding it to the butter. That way you can be sure to get smooth buttercream icing. Some do not find this step important but trust me on this and just don’t skip it. 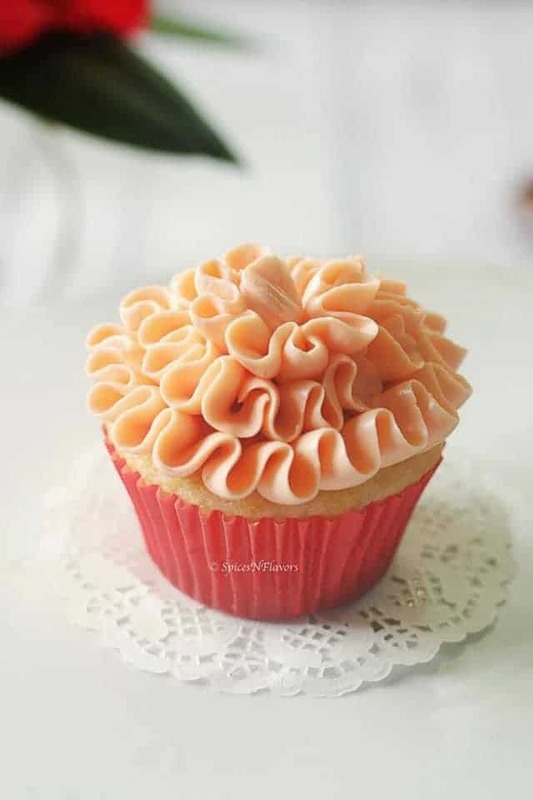 Once you start adding your icing sugar, do not beat it for more than 30 sec to a minute or else you would end up creating bubbles in your buttercream frosting which would show up when you frost a cake. Always use Cream as your liquid of choice, that makes the frosting creamier, tastier and flavourful. All these may seem simple to you and most of you might be already knowing it but when you actually start applying the tips in the step by step recipe format that I have shared you will understand why am I stressing it so much. Important Points: How do you make the best buttercream frosting? Start by beating the softened and cubed butter until pale in colour, light and fluffy. This would take anywhere around 10 mins depending upon how soft the butter is to start with. Always and always use paddle attachment that would ensure that you are not incorporating much air in the buttercream. Sift the icing sugar at least twice. Just do not skip this step. It would ensure that the buttercream is smooth and not gritty. Start adding the icing sugar in batches. 1. If you add all at once, all your worktop including you would be covered in icing sugar dust – haha unless you are planning a romantic date with your partner; you know what I mean 😉 just do not try this otherwise. 2. Scientifically speaking, the icing sugar won’t get enough time to dissolve with the butter and thus would not turn out to be smooth. There is also a perfect way of doing this step. So you start by adding icing sugar in batches say 1/2 cup. Then either you can choose to mix it with a spatula or beat the machine on low speed until some of the sugar is mixed in. Then at high speed beat the butter and sugar for around 30 sec to a minute not more than that. We do not want to introduce air in the buttercream as this would create bubbles while frosting and would then show up on the cake. So the mantra is to not beat the butter and sugar for more than 30 sec to a minute at a time. 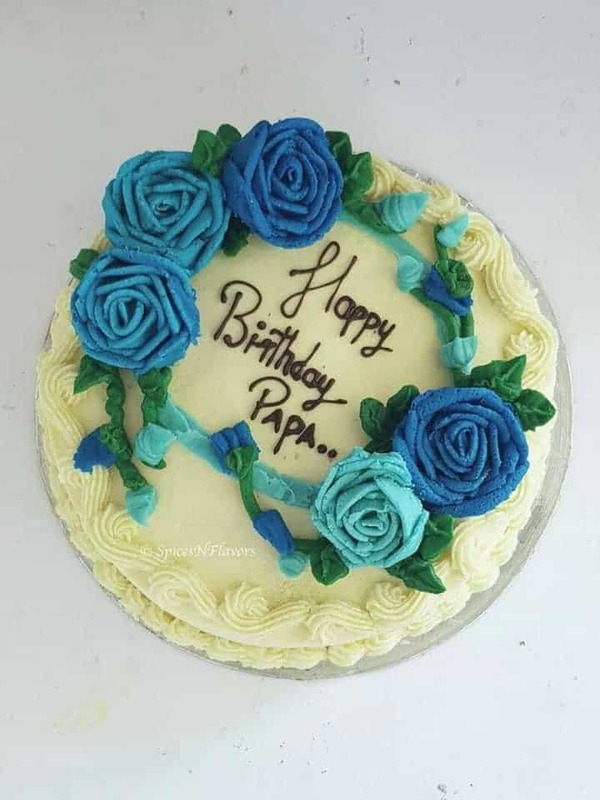 Add cream, colour and flavouring essence of your choice and adjust the consistency as per the purpose of Buttercream – filling, layering, frosting, piping or making buttercream roses. Just take the required amount of buttercream in the piping bag at a time. That is because the warmth of your hands would melt the butter and your piping would not hold its shape then. Cover the remaining buttercream with a damp tea towel to avoid crusting on top. And that is the only simple steps you need to follow to make this easy buttercream frosting recipe. How do you make buttercream? 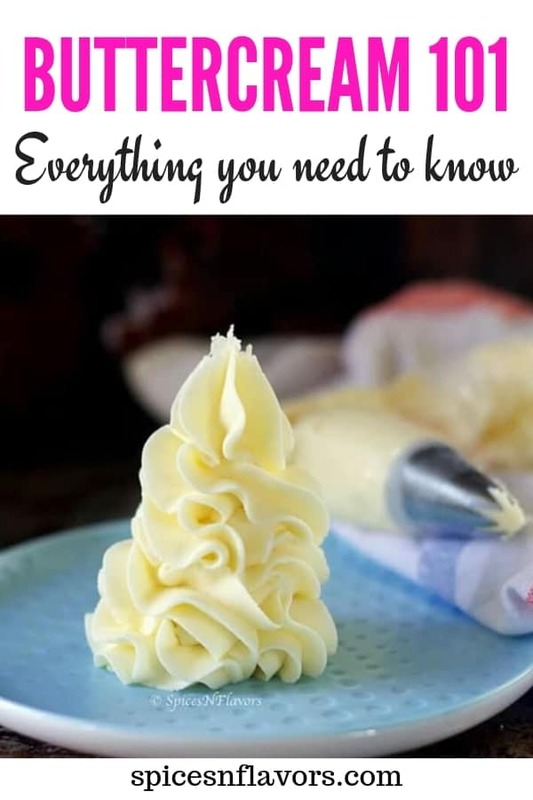 Learn how to make Classic Buttercream Frosting recipe that is not too sweet with this easy video tutorial. This is the best buttercream frosting for decorating cakes, for piping flowers, layer cakes, icing wedding cakes, vanilla cupcakes. Using the paddle attachment of your stand mixer, start beating the softened and cubed butter until pale in colour, light and fluffy. This may take anywhere around 10-12 mins depending upon how soft your butter is. Do remember to scrape the bowl every now and then so that you beat the butter evenly. 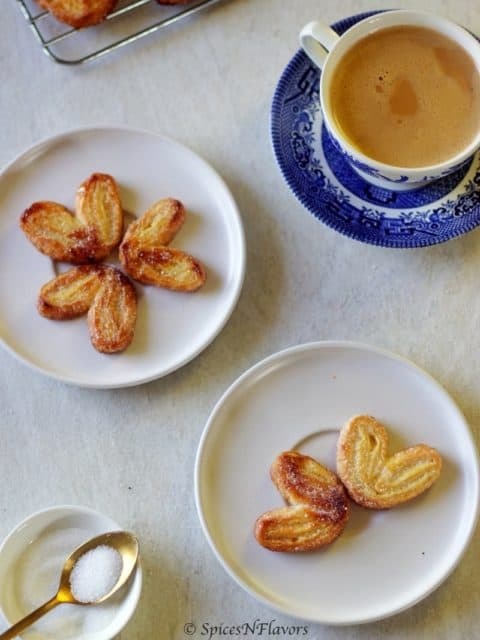 Meanwhile, sift your icing sugar at least twice. Keep aside. Once the butter is pale, light and fluffy start adding your sifted icing sugar in batches. Once you add 1/2 cup or first set of icing sugar, beat it at low speed until some of the sugar is absorbed and mixed in and then increase the speed and count till 30. You have to beat the butter and sugar for not more than 30 sec to a minute each time. Repeat the step until all the sugar is used up. Then in goes the flavouring essence of your choice, colour. Give a quick mix. Start adding a tbsp of cream at a time until you reach the desired consistency of your choice. Once all the ingredients are in, beat the buttercream for 3 mins to ensure that everything is well combined and the buttercream is smooth and fluffy. You are now ready to use this buttercream frosting. Add in the condensed milk and flavouring of your choice. The basic ratio for butter to sugar that I use is 1:2 so 1 part butter and 2 parts sugar works perfectly fine for me to fill and frost a cake or cupcake and is not sickly sweet too. For making buttercream roses I use 1:2.5 as the base ratio to get a stiffer rose flower. Always remember to cube the softened butter so that the beating process is easy. Never use cold butter and at the same time also do not use melted butter. It is important to use sifted icing sugar. Do not beat the sugar and butter for more than 30 sec to a minute. Remember to use good quality ingredients to get the best final outcome. Take just a small amount of buttercream in your piping bag as the warmth of your hands would soften the buttercream and then it might lose shape. Always cover the rest of the buttercream that you are not using with damp cloth to avoid crusting on top. 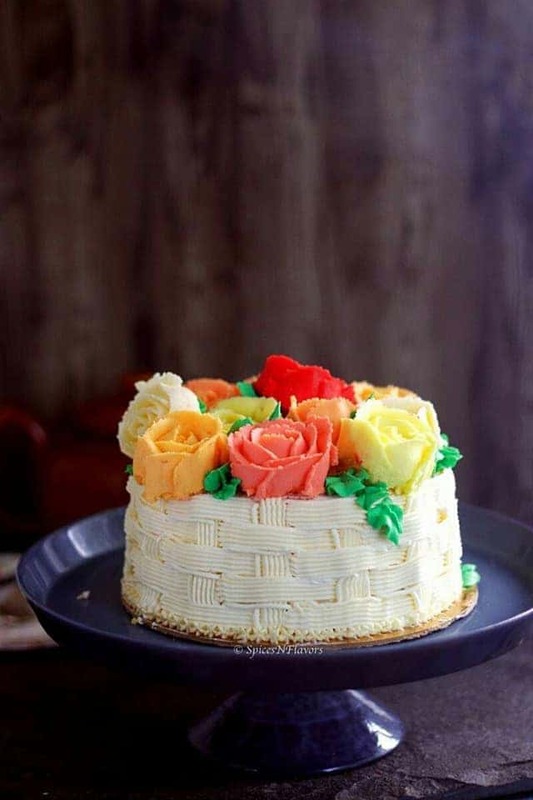 If you have queries like best food coloring for icing, how to color buttercream icing red, how to colour buttercream with liquid food colouring, how to colour buttercream pink, how to get bright coloured buttercream then this section is all you need to know. Any colours like gel colour, liquid food colouring or powder colours can be used to colour buttercream. My choice of preference is gel based food colour. One thing to keep in mind is that colour would darken in a few hours. So if you wish to make red or black coloured buttercream always make it ahead of time and give it a resting period of 5 hours that way the buttercream will have time to absorb the colour and darken and you will achieve the desired coloring of choice. And yes you will need a lot of food colouring.. drops won’t work here.. you will have to start by adding at least 1 tsp of colour to begin with. Mix and then see how it goes for dark buttercream colours. This is the secret to making red and black colored icing. Using liquid colours would have an effect on the consistency of buttercream as it might thin down the frosting a bit, which you can firm up by adding some icing sugar but again that would add to the sweetness so use wisely. And for powder colours dissolve it in warm water first before using, that way you can be sure that it mixes evenly with the frosting. Pretty pastel colours are what you want then prefer powder colours for the same. Gel colours are the best to colour buttercream. Start by adding just a drop, the safe way is to use a toothpick to transfer the colour. Beat it well so that the colour mixes evenly. 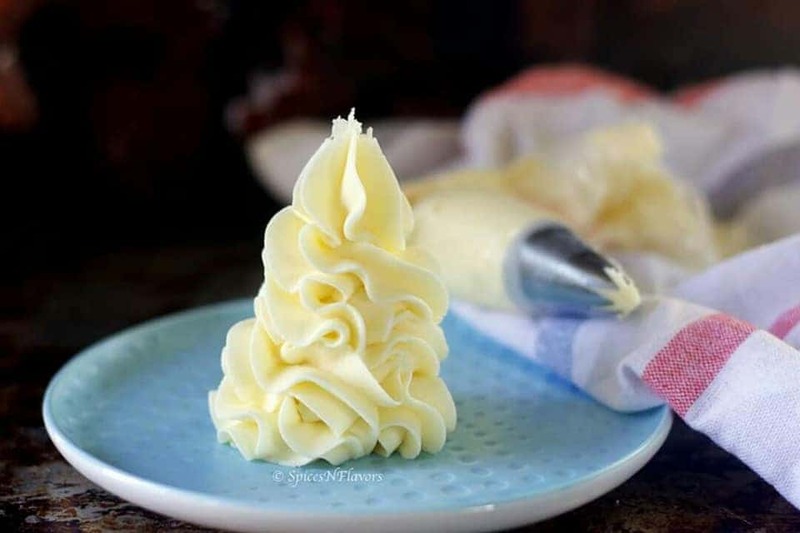 How to make stiff Buttercream? The recipe shared above pretty much yields a stiff buttercream. But if you are looking for a crusting type or really stiff buttercream you will have to increase the amount of sifted icing sugar to 3 parts. That way you would get stiff buttercream perfect enough to make buttercream roses. Can u make buttercream frosting ahead of time? and How to store buttercream? Yes, definitely you can make buttercream ahead of time and store in an airtight container for up to 2 days at room temperature. It also lasts for up to a week in the fridge and for about 2 months in the freezer. If storing in a freezer it is advisable to trasfer your buttercream to a cling wrap sheet, fold it neatly and tightly and store as that would save space in your freezer as compared to storing in an airtight container. Always recommended to bring it to room temperature, re-whip until it is smooth and creamy once again and then use as per your needs. I agree that was way too much for one single post to consume right!! Even after you follow all the steps and tips and techniques all right there might be some issues for beginners. So let’s fix them. If you feel the buttercream was stiff but is not piping beautifully like the way you wanted, it might have happened that the heat of your palm melted down the buttercream in the piping bag. Simply put it back in the refrigerator for around 10 mins to firm up and then use again. If you forgot to cover the unused buttercream using a damp cloth and later realise that it has started to form a crust. Do not worry, simply give a gentle mix with a spatula so that it turns creamy and then use it. If your butter has softened too much such that it has started to melt. Keep it in the refrigerator to firm up a bit and then use in the recipe. Never work with melted butter. The buttercream straight from the fridge would be hard and crusty to fill, layer and frost. Always allow it to come to room temperature, re-whip and then use as needed. The basic way of flavouring your Buttercream still is classic vanilla buttercream icing as mentioned in the recipe. However, you can change the flavours by just adding different flavouring essence in place of vanilla like peppermint, lemon, coconut, almond etc. I get it if Chocolate Buttercream Icing is what you are wanting to make, simply use 1/2 cup of unsweetened cocoa powder, sift it, then mix into the frosting until well combined. Add in 1-2 extra tablespoons of heavy cream if needed for a smoother, creamier frosting. For Caramel Buttercream Frosting, Mix in 1/3-1/2 cup of homemade or store-bought caramel sauce (start with 1/3 cup and add more if desired). For a salted caramel frosting, you can use salted caramel sauce. Similarly, use the butterscotch sauce for a Butterscotch Buttercream frosting. The choice just remains endless!! Just pat your back for sticking around till the end guys!! Kudos to you.. I hope you found this post informative and not boring, have put my heart and soul to include as many details as I can in this single post. If there is still any doubt lingering in your mind about making the Best Buttercream Frosting then do leave a comment below or tag me on any social media like Facebook, Twitter or Instagram and I would love to share whatever knowledge that I have. If you are a beginner then definitely check out my other basic frosting recipes like – Stabilized Whipped Cream, Stabilized Chocolate Whipped Cream and Italian Meringue Frosting. You will love those too. Definitely, check out my Frosting Board on Pinterest for more such informative ideas. 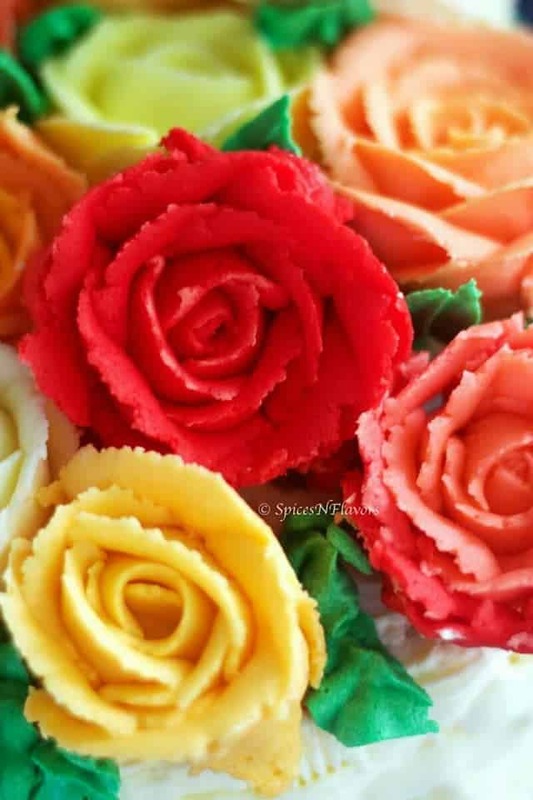 And if you would like to have a separate post on How to make Buttercream Roses then definitely do let me know about the same too. I will see you soon with yet another one. So glad to learn that.. Thank you for sharing your thoughts with me.. really appreciate it..
What a detailed and fabulous post, one of your best posts till date! Great work, Sushma! A very handy post tackling all the queries! I am a home baker. Thank you so much for writing this blog! I tried this recipe for making Strawberry buttercream and it worked wonders! I usually prefer IMBC over American, probably because I never had all the right steps to follow for ABC, but this one is an exception! I will definitely use it more often on my bakes! Thank you for such a detailed post! Looking forward to more such informative posts from you. Yay!!! thanks a ton for sharing your wonderful experience with me.. And yes you are right, that was the whole point for me to write this post that is to encourage beginners and home bakers to start baking and try different frostings as we have always stuck to whipped cream only. No complaints there no doubt its the best but still trying other frostings is super handy specially when it comes to decoraitng. Really appreciate your feedback. Thanks a bunch. Hi Sushma, thanks for the detailed info. I am a beginner to baking and so far tried only readymade whipped cream. Now will dare to try ur buttercream. But I have a few queries..
1. which butter would u recommend ? Amul,Delicious or Margarine ? Or any other unsalted butter brand ?? 2. Icing sugar from Blue Bird and other brands will do, rt ? 3. The proportion given by you will make buttercream enough to coat half kg cake – between layers and decoration both? So glad to learn that you liked the post.. thanks a bunch for sharing your wonderful thoughts with us.. I will be honest with you for all your queries.. Since I live in New Zealand I have never tried any Indian butter for baking. My suggestion would be to use any good quality pure butter for better results. Margarine is basically a shortening about which I have mentioned in the post. I would suggest not to use margarine for home baking purpose. 2. Again for icing sugar, any brand would work, need not be the best quality as the actual taste comes from butter only. so any local brand icing sugar would also work just make sure to sift it before using. 3. And I have never worked with weighing the cake as I am not into taking orders. Have always calculated as per the size so to fill and frost a 6-inch cake with 2 layers of cake and 1 layer of filling I would use 150 gms of butter. Hope this helps a bit. If you still have any doubts definitely pingback. would try to answer those as well. Lovely Sushma! Can I make a request can you share royal icing for cookies? And yes royal icing is on my list too.. Will try to post a recipe on the same at the earliest..
Wao Wao Wao!!! I never leave comments on blog but I can’t stop myself today. Me and my husband used to HATE buttercream just coz of too much sugar until tonight. I really appreciate your efforts on putting soooo much details and tips for do’s and don’t. Can’t thank you enoug for putting such a great recipe out there for us beginners 🙏🏼❤️. That is so kind of you to pen down your experience so well.. I am so glad to learn that this recipe gave you the perfect results that you were after.. Thank you for giving this recipe a try and more than that sharing your feedback with us. You are so wonderful. Thank you so much. I really appreciate your efforts on putting so much details and tips for do’s and don’t. Thank you so much Erin.. I am so glad to learn that this post helped you in someway.. thank you for sharing your thoughts with us..
My problem is making frosting to coat outside of the….i used eggwhite..and granulated sugar…because after coating outside of the cake..after few hours i dad a hard time decorating it because as i applied the decor piping the buttercream wont stick to the cake coat because it soften ..do i have to add more sugar to my frosting to make it harder .. Thank you for taking the time out to type in but could you please elaborate on the issue. You mean to say that the buttercream hardens after sometime and you are not able to decorate? Hi, Thank you for the detailed post. I will be making a layered naked cake for my sons casual wedding and wanted to know how well the frosting will hold up with the butter as opposed to shortening. The wedding is outdoors and the reception will be in a cave. The cake wont be in the sun and the cave is fairly cool with all the rock but it will probably be 85 degrees outside. Congratulations on your son’s wedding.. Best wishes to you and your family..